Astroland's rocket enters history, charting New York's windiest spots, and more bits and pieces from around the NYC web. The Astroland rocket, one of the most iconic symbols of the Coney Island that was, has been donated to the city. 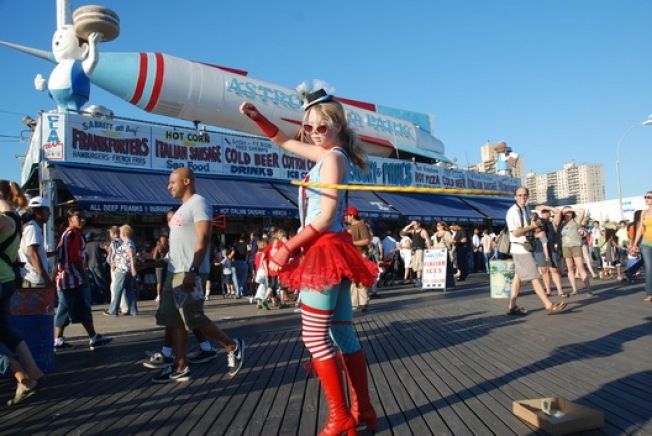 Coney Island's Astroland Rocket has been donated as a historical artifact to the city.NYC plans to eventually place it on display amid the whatever of all-new Coney Island, as a charming tribute to a time before condos ruled the earth. In hipster Brooklyn, counterfeit concert tickets shouldn't stand in the way of true love, right? In yet another case of Obama-fueled Chicago envy, Daily Intel asks, where is New York's windiest location? From the "You know things are bad when" file: Balthazar reports earnings down 15 percent. ...Although they can't be that bad if people are bidding on an $80,000 Spongebob Squarepants pendant, right? At the Times, Maureen Dowd tries to coin the phrase "socialist jet-setters." Is that like "limousine liberals" for the '00s? Sonic Youth's Kim Gordon will do a design collaboration with Urban Outfitters. Have you been touched by the Bacon Explosion? Starbucks will stop brewing decaf after 12PM, having noticed that coffee-drinkers who patronize the green mermaid in the afternoon are trying desperately to stay awake. Overprotective parents, take note: If the Times says that babies eating garbage off the sidewalk is good for them, it must be true. …ICYMI: Aretha Franklin's Inauguration performance is the new "Single Ladies."